On Sunday, November 11th, the AASB membership met as a Delegate Assembly to approve the final resolutions that make up the document “Where We Stand 2019”. 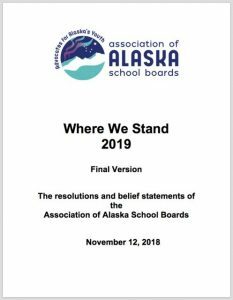 These resolutions provide the basis upon which the association may take a position on a wide variety of topics and issues facing education and students in the state of Alaska. If you’re interested in the Resolutions process as it unfolds, please review this information. AASB is soliciting resolutions, resolution amendments and comments from local school boards for consideration at the 2018 Annual Conference on Nov. 8-11 at the Anchorage Hilton Hotel. These resolutions guide our association for the coming year beginning November 12, 2018. They also guide our advocacy and positions during the upcoming legislative session. Looking ahead to 2019, the 31st State Legislature and the next Governor will continue to deal with the state’s fiscal crisis. Education issues, such as a focus on the Base Student Allocation, will continue to be a primary concern. The State Board of Education and Commissioner Johnson will continue moving forward with the state strategic plan for education and Alaska’s Education Challenge, which AASB has helped to facilitate. AASB continues to work closely with DEED in trying to move Alaskan education forward so that every student can receive an excellent education every day. As you review the resolutions packet, please think about the issues facing your district, and possibly others across the state, and our role in advocating for quality public education through effective local governance. The AASB Board of Directors at its July 2018 meeting in Girdwood reviewed the current resolutions scheduled to sunset. The AASB Board recommended the renewal of all 20 resolutions that are scheduled to sunset this year except for 4.10 Urging the State of Alaska to Continue the Retire-Rehire Program. This issue was resolved in the 30th Legislature. A list of those resolutions due to sunset is included in a separate document (2018_Table_of_Sunsetting Resolutions.pdf). The AASB Board of Directors has no new resolutions or amendments to resolutions it wishes to put forward. The AASB Board continues to be concerned about student achievement of all students but in particular Alaska Native students. The Board continues to want to focus on personalized learning, as well as parent and community engagement, and the application of social-emotional and culturally responsive educational practices. Furthermore, AASB staff analysis of recent legislative action affecting education prompted the board to ask districts to consider possible resolutions supporting a school board’s local authority regarding SB 104 Educational Curriculum Requirements and SB 216 School Funding for Consolidated Schools. The board expressed concern there could be a progression over time towards less local control and increased state mandates. Your board may wish to comment on any existing resolutions or submit new resolutions or amendments. Remember, only the title and resolution are voted on by the membership, not the rationale. We do welcome comments about rationale. In order to comment on or put forward suggested resolution changes, AASB requests your board schedule time to discuss the resolutions at a regular meeting and vote by official board action. The deadline specified by AASB bylaws for the AASB office to receive your comments and proposals is October 8, 2018. We require all submissions of comments, new resolutions, or amended resolutions be submitted digitally via email by the date specified above. A PDF fillable form is included for your use and to aid you in pthe roper convention when submitting new or amended resolutions and comments. Each board should also send accompanying documentation such as a cover letter from the board president stating when the board took official action on the resolutions. Address your district’s proposed resolutions and/or amendments to: Resolutions Committee at aasb@nullaasb.org. Two webinars are scheduled to review the Resolutions Process. The first will be Wednesday, August 15 at noon AST. A repeat of the first webinar will occur on Wednesday, September 5th at noon AST. Both webinars will be hosted by Lon Garrison and Norm Wooten to review the process and answer any questions you may have. Thank you for you and your boards continued commitment to providing every student with an excellent education, every day! We look forward to receiving your comments, amendments, and resolutions.